More than 20 probies have been removed from the FDNY class after showing signs of the bacteria, a spokesman said. 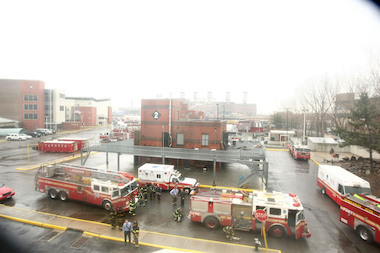 RANDALL’S ISLAND — The FDNY commissioner has ordered a massive cleanup of the fire academy and its gear after more probationary firefighters were pulled from the class due to possible infection from the drug-resistant MRSA superbug, DNAinfo has learned. Commissioner Daniel Nigro also ordered a change in the training exercises that have caused probies to cut themselves — injuries that have led to the vast majority of the stubborn bacterial infections, which were first reported by DNAinfo. Over the past two weeks, the number of confirmed cases of antibiotic-resistant Staphylococcus aureus linked to the academy has jumped to 13, up from 6. The combined number of possible and confirmed cases has risen to 22 at the Randall's Island facility as the second training class in a row struggles with the stubborn germ. All of those pulled from the class were placed on either light duty or medical leave, and at least six have returned to class, a spokesman said. At least one trainee required hospitalization from the MRSA infection, but has been released. Nigro sent a memo, obtained by DNAinfo, to every firehouse and EMT facility in the city Thursday night detailing the actions taken by the department to "protect all personnel who train, work or visit the Academy" on Randall's Island. "We are seriously concerned with the recent cases of MRSA among the current class of probationary firefighters at Randall’s Island and have acted aggressively both to understand how this occurred and to do everything possible to eradicate the problem," the memo states. "All physical activity at the academy has been canceled through Monday — and the probies will be transferred Friday to the FDNY facility at Fort Totten, where they will take their midterm exam while the Randall’s Island facility is cleaned," FDNY spokesman Frank Gribbon said. They are expected to return to the training center on Tuesday. Other personnel will remain at the Academy during the cleaning process, which is expected to stretch through the Labor Day weekend. Gribbon said the FDNY was consulting with the Department of Health, an infectious disease specialist recommended by the DOH and the department’s own doctors to thoroughly disinfect high-risk areas such as locker rooms, bathrooms, the auditorium where students spend a lot of time and rooms where gear is stored. The DOH referred all requests for comment to the fire department. A private vendor that the FDNY already used for cleaning will scrub the high-risk areas with the EPA-approved cleaner Dispatch that is said to kill the MRSA bug. Students have also been given a special disinfectant, Hibiclens, to use when they shower at home daily, according to the memo. Bunker gear and hoods worn by the student firefighters have also been collected and will be thoroughly cleaned by another private laundering service, although Gribbon said they have to be careful with the cleanser that's used so they don't damage the fire-retardant clothing. The gear will be returned to the academy on Tuesday and Wednesday. According to the memo, all but one of the cases stemmed from open knee wounds obtained during calisthenics or a specific training exercise called "Motivation Alley" "where probationary firefighters advance and operate hoselines." The drill was causing scraped knees, even with protective gear, and those scrapes were the root of the MRSA infection, officials said. Motivation Alley has been halted until the Fire Academy obtains rubber mats, the memo said. The FDNY began monitoring the MRSA cases in early August but took tougher measures once the number of probies showing signs of the infection began to rise, according to Gribbon. They had previously worked on wound care, inspecting each student firefighter for open sores and making knee pads mandatory during training, specifically crawling exercises. Cleaning was undertaken as well, but it was not clear which agent was used. But the academy was not shut down. “From the start, the commissioner has been seriously concerned about the health and safety of all of our members, and he wants to do everything necessary to make sure we eradicate this problem,” Gribbon said. The recent MRSA outbreak isn't the first time the FDNY dealt with the drug-resistant bacteria at the academy. Three probies were removed from the fire academy during the January class after picking up the germ, the FDNY confirmed. The department said in the memo that the FDNY had also dealt with MRSA cases in firehouses, but specifics were not immediately available. MRSA is usually spread by direct contact with wounds or contaminated hands or equipment, according to the Centers for Disease Control and Prevention. It can cause pneumonia and bloodstream infections, which could be life threatening.